Spherophakia (also called microspherophakia) is a rare congenital condition of the eye in which the crystalline lens is more spherical in shape, with increased anteroposterior diameter with a decrease in equatorial diameter., We present a case of isolated spherophakia with secondary angle-closure glaucoma managed surgically without laser iridotomy, highlighting current trends in the management of spherophakia and secondary angle-closure glaucoma. A 16-year-old girl presented with complaints of recurrent headaches for the past 3 months despite wearing glasses. Refraction revealed unaided vision of 20/800 with −22.5 DS/−3.00 DC × 50° and −23.5 DS/−3.00 DC × 50° correcting to 20/60 in the right (OD) and left (OS) eyes, respectively. Before any medications, routine intraocular pressures (IOPs) using air-puff noncontact tonometry were 18 and 42 mmHg. Despite the high pressure, mydriatic drops were instilled inadvertently in the left eye before the ophthalmologist's evaluation. Subsequent slit-lamp examination revealed uniformly shallow anterior chambers and abnormally thick and round lenses [Figure 1]. IOP by Goldmann applanation tonometry was 16 and 40 mmHg in the right and left eyes, respectively. Both eyes showed no iridodonesis or asymmetry in anterior chamber depth. The zonules and edge of the lens of the dilated left eye were clearly seen. Axial lengths were normal (OD = 23.68 and OS = 23.64 mm), and keratometry readings of both eyes were normal (OD: 43.5 × 180°; 45.5 × 90° and OS: 44.25 × 180°; 45 × 90°), thus confirming myopia to be purely lenticular. Therefore, a diagnosis of bilateral spherophakia was made. Systemic examination was unremarkable and showed no features of Weill–Marchesani, Marfan, and other commonly associated syndromes. She was observed for 24 h on acetazolamide. At discharge the next day, the IOPs were 14 and 20 mmHg. This suggests that cycloplegia, though inadvertent, may have helped in relieving the pupillary block. This led us to suspect inverse glaucoma as the pathogenetic cause. The anterior chambers also appeared to have deepened dramatically by the 2nd day, again possibly due to the cycloplegic effect [Figure 2]. On review, IOP was under control (OD = 14 and OS = 16 mmHg). Repeat gonioscopy revealed bilateral appositional angle closure with no peripheral synechiae. Dilated fundus was normal with healthy optic discs of cup-disc ratio 0.3:1. Visual field analysis was unreliable. Laser peripheral iridotomy (PI) was deferred as the patient was keen on lens extraction at the earliest. Having controlled the IOPs, phacoemulsification with intraocular lens (IOL) implantation was performed for the left eye. A single-piece foldable hydrophilic acrylic IOL of +19.5 D was placed in the sulcus. During the procedure, the surgeon experienced technical difficulty in placing the IOL in the bag as the bag appeared to be stretching and distorting the shape of the rhexis. For fear of a tear due to overstretching of the bag, the IOL was dialed out of the bag and placed in the sulcus. Postoperatively, the IOL was stable and well centered [Figure 3]. A three-piece IOL was not attainable due to inaccessibility. At follow-ups on 2, 6, and 12 weeks' postleft eye surgery, she continued to have normal IOPs though topical timolol was continued for a period of 2 weeks postoperatively in the left eye. She subsequently underwent phacoemulsification and sulcus implantation of IOL of +20 D for the right eye. On last review, the best-corrected vision in both eyes was 20/40 with IOPs of 12 and 14 mmHg in the right and left eyes, respectively. Isolated cases of glaucoma secondary to angle closure have been documented in spherophakia.,,,, Due to the relative rarity of the condition, management of this condition has been largely institution based and lacking unanimously accepted guidelines. Hypoplasticity of the ciliary body and zonules is thought to be the cause for the persistence of sphericity of the fetal lens into adulthood. This weakening enhances lens mobility, commonly anteriorly due to the relatively dense nature of the vitreous, resulting in iris–lens contact and pupillary block glaucoma. PI frequently does not control pressures in cases of angle closure secondary to spherophakia., There could be three plausible explanations for this. First, synechial angle closure would not be relieved by only iridotomies if extensive. One group found that 14 out of 16 spherophakic eyes with synechiae and secondary glaucoma required further treatment for IOP control. Second, congenital angle anomalies could be present in these cases. Third, anterior dislocation of the lens due to progressive weakening of the zonules can also prevent re-opening of the trabecular meshwork even after PI. One study documented 53 subluxations and 14 dislocations out of 159 eyes with microspherophakia. Even in the absence of anterior subluxation, crowding of the trabeculae could happen due to the shape of the spherophakic lens. In our patient, as clear lens extraction had been planned for visual rehabilitation and treatment of appositional angle closure, laser PIs were not done. Recently, a few protocols have been proposed for the management of secondary angle-closure glaucoma in spherophakia. One group suggests laser PI ± medications and further trabeculectomy only if IOP is uncontrolled. Lens extraction was only advised if subluxation of lens were present or if trabeculectomy led to persistently shallow anterior chambers. Another study described clear lens extraction along with medications in secondary glaucoma management. They suggested that the crystalline lens, being the pathological cause for glaucoma in spherophakia, should be the logical focus of treatment. Appositional angle closure was successfully treated with solely medical therapy only in 18% of 51 eyes with spherophakia. The rest required surgical intervention. Blindness secondary to glaucoma is common in spherophakia, with the largest study showing blindness in 19% of 159 spherophakic eyes. This may be due to the difficulty in accessing specialist health care in remote areas. It is also possible that even advanced glaucomatous visual field loss may not be symptomatic due to the relative visual minification and higher-order aberrations in spherophakic patients with high myopia. Any patient with high myopia, raised IOPs, and uniformly shallow anterior chambers should alert the clinician of the possibility of spherophakia. Gonioscopy, assessment of the lens zonules, and ultrasound biomicroscopy of the ciliary body are helpful in making distinctive diagnostic and management decisions specific to each case. Early surgical intervention may be a suitable option for spherophakic patients with high myopia and angle-closure glaucoma, as lens extraction (and a filtering surgical procedure in cases of extensive synechial angle closure) treats all the possible causes of secondary glaucoma in spherophakia. This has special relevance for hospitals based in rural settings where long-term compliance to medication and review poses a distinct challenge. The authors would like to thank Dr. Subodh Rath, Department of Ophthalmology, Jivan Jyoti Christian Hospital, Robertsganj, for material support. Macken PL, Pavlin CJ, Tuli R, Trope GE. Ultrasound biomicroscopic features of spherophakia. Aust N Z J Ophthalmol 1995;23:217-20. Johnson GJ, Bosanquet RC. Spherophakia in a Newfoundland family: 8 years' experience. Can J Ophthalmol 1983;18:159-64. Asaoka R, Kato M, Suami M, Usami Y, Hotta Y, Sato M. Chronic angle closure glaucoma secondary to frail zonular fibres and spherophakia. Acta Ophthalmol Scand 2003;81:533-5. Kanamori A, Nakamura M, Matsui N, Tomimori H, Tanase M, Seya R, et al. Goniosynechialysis with lens aspiration and posterior chamber intraocular lens implantation for glaucoma in spherophakia. J Cataract Refract Surg 2004;30:513-6. Willoughby CE, Wishart PK. Lensectomy in the management of glaucoma in spherophakia. 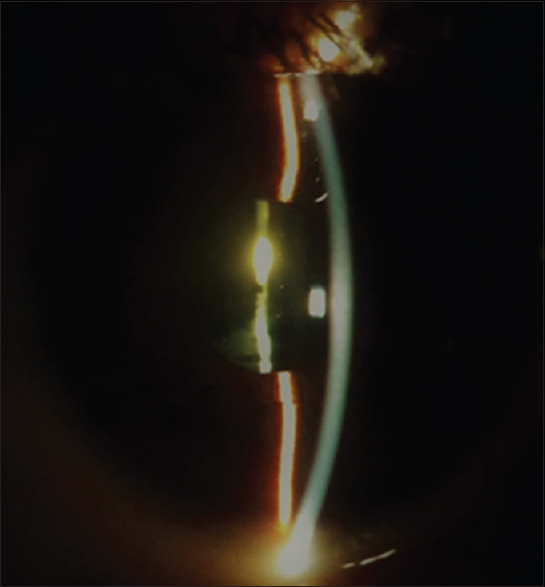 J Cataract Refract Surg 2002;28:1061-4. 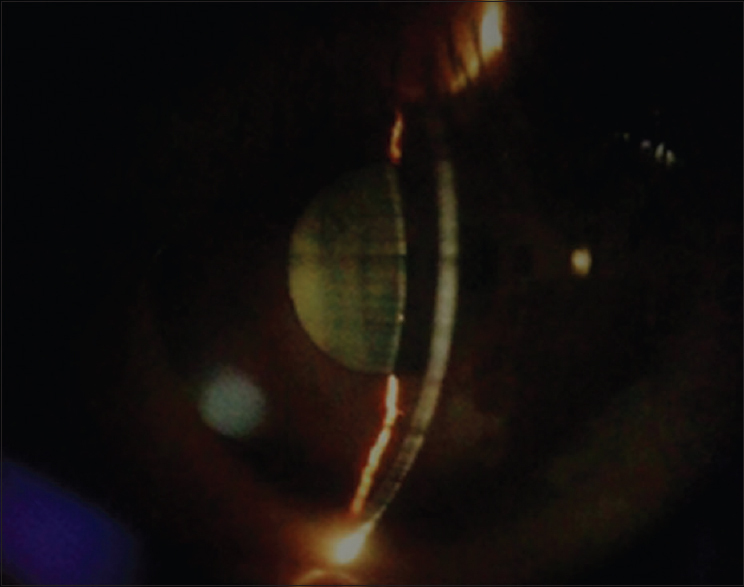 Bhattacharjee H, Bhattacharjee K, Medhi J, DasGupta S. Clear lens extraction and intraocular lens implantation in a case of microspherophakia with secondary angle closure glaucoma. Indian J Ophthalmol 2010;58:67-70. Kaushik S, Sachdev N, Pandav SS, Gupta A, Ram J. Bilateral acute angle closure glaucoma as a presentation of isolated microspherophakia in an adult: Case report. BMC Ophthalmol 2006;6:29. Senthil S, Rao HL, Hoang NT, Jonnadula GB, Addepalli UK, Mandal AK, et al. Glaucoma in microspherophakia: Presenting features and treatment outcomes. J Glaucoma 2014;23:262-7. Yang J, Fan Q, Chen J, Wang A, Cai L, Sheng H, et al. The efficacy of lens removal plus IOL implantation for the treatment of spherophakia with secondary glaucoma. Br J Ophthalmol 2016;100:1087-92. Senthil S, Rao HL, Babu JG, Mandal AK, Addepalli UK, Garudadri CS. Outcomes of trabeculectomy in microspherophakia. Indian J Ophthalmol 2014;62:601-5.